Don’t you love those little zingers you get from God. Here I am, not even through my first cup of coffee, having my morning meditation time with God and he zips in one of those zingers. 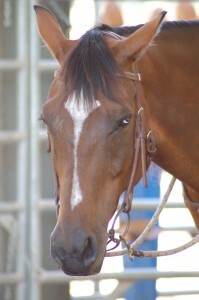 With my horses I am always wanting them to be light and soft in their responses. I was asking God how I could help the horses with this and he had the nerve to suggest that I would have to get soft myself. What’s with that? So I had to backtrack a bit and think about what softness really is. I understand a horse can be light but not soft. Lightness is about doing the right thing but softness has more to do with your attitude when you do it. My mare, Cerise, is light and will always do what I ask but she is often stiff when she does it. For example when I ask her to stop she sometimes tightens her back and braces into her front end rather than relaxing her back and shifting her weight to her hind end. So what makes Cerise brace rather than get soft? I think she does not trust me and most of the time she thinks she knows the best way. Cerise also tends to be a bit anxious rather than peaceful in her approach to life. Uh oh. I think this would describe me as well. So, if softness is adopting an attitude of peace and trust how can I model this for my horses. Pingback: Learn Horseback Riding » Holistic Horsemanship – Are you soft around your horse? I thought this was great information and a good reminder that our horse is our mirror!